A post dedicated to our new blue friend. It’s hard to comprehend that he has been part of our lives for only three months. 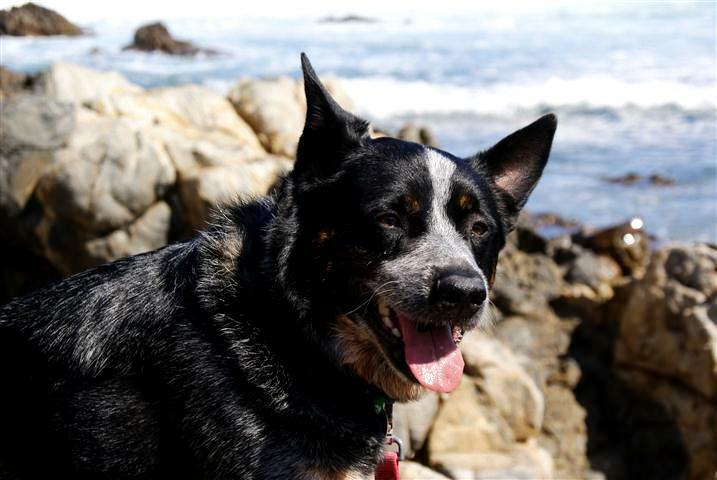 Adopted from a young family in WA’s south-west, this seven-year old blue heeler is one ‘special’ dog. We love him dearly and it has been a great trip really getting to know him and understand his quirky ways. Don’t touch his feet – he doesn’t like it. He curls up like a cat and if you try to touch his feet he tucks them further and further under him. He doesn’t like March flies – one of the funniest things we have seen him do. If a March fly buzzes past, he goes on a manic rampage to catch and chew it. He becomes obsessed beyond all reason. If all else fails, he takes himself inside the camper, car or kennel and refuses to come out while the flies are around! Sleep – perhaps this Dog is part-cat? He snores like a road train at times, but regularly takes the opportunity for a nap. We laugh and laugh at the occasions he chooses to do this, like in the middle of the sand track to Cactus Beach after a relatively leisurely walk along the cliff tops. What kind of dog just lies down in the middle of everything and goes to sleep? He has worked out that he can sleep quite happily in the car. He has had the whole back seat to himself for a month and we don’t think he is planning on sharing it with anyone. At night he sleeps in the camper and it would appear that the club lounge is now ‘his’ bed…! Scones – try eating a dozen uncooked scones that have been left sitting on the camper table for less than a minute while we weren’t watching (they were waiting to go into the camp oven). Yep, he did it. Neither of us could work out where the scones actually went as The Dog just carried on as though nothing had happened. We have been laughing for days about it! Welcome to our family Dog! Watch his eyebrows in this clip..
What a nice little tribute and the scones story is fully funny … can just imagine it 🙂 A really great blog ML of an awesome trip, I feel relaxed just reading it. Well done you certainly have a wonderful way with words.